Interior of The Photo Play Theater, Columbus, Ohio, as seen in an advertisement for Wurlitzer organs in Moving Picture World, 1912. In the early days of motion pictures, when movies were made in New York instead of Hollywood, when Fatty Arbuckle and Mabel Normand ruled the box office, and stars like Charlie Chaplin and Mary Pickford were just getting started, the University District was awash in small motion picture theaters. In 1915, Columbus had 67 motion picture exhibitors. Seven of these--a tenth of all the theaters in Columbus--were here in the University District. There were more theaters here than in any part of town outside of downtown. Students. Ohio State's 4,000 students were a big and desirable market. Then as now, young people were hungry for entertainments and diversions. Young people had the free time to enjoy entertainments. Young people had disposable income. Young people were willing to experiment and try something new. They were unfettered by old ways and tired prejudices. Young people enthusiastically embraced new technology. High Street between 10th and Chittenden was the commercial heart of the campus area in the 1910s and The Photoplay at 1597 N. High St. was right in the middle of it. The Photoplay's immediate neighbors were a Kroger's Grocery and Bakery at 1593 and a Varsity Supply general store at 1599. Elsewhere on the block were jewelers, barbers and beauty salons, candy shops, a drug store, laundries, a garage, and a gas station. Just south of the Photoplay, at at 1575 N. High St. was another theater, The Bide-a-Wee (1913-22). Across the street at 1548 was the famous Marzetti's Restaurant, a campus landmark, and--not far away--stood another popular student hang-out, The Varsity Inn at 1598. Above the shops, on the second floors of the buildings, were offices for optometrists, dentists, tailors, lawyers, dressmakers, auctioneers, and some apartments. Night and day, the area was thronged. Whatever a student needed--from soap to a spaghetti dinner--he could find it within a block or two of 11th and High. 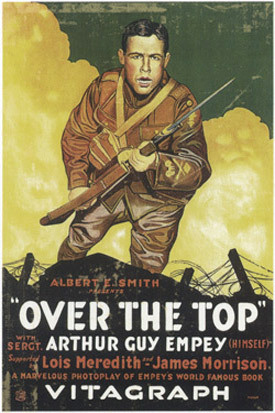 The Photoplay did its best to put filmed entertainment on the list. Advertisements from The Ohio State Lantern for films at the Photoplay, spring 1912. Apparently, "powerful" was the buzzword movie fans wanted to hear. 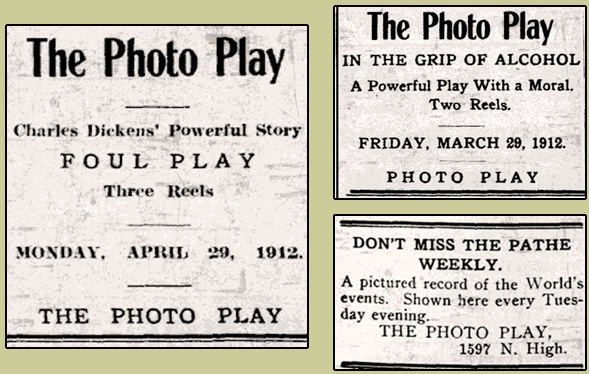 No photos have surfaced that show the exterior of The Photoplay. It may have been modest or, in keeping with the interior, fancy. Either way, it was probably garishly covered in brightly colored banners, signs, placards, and posters to attract patrons. Subtlety was not a word in the vocabularies of movie theater operators in the 1910s. Inside, The Photoplay was much nicer than a typical storefront theater. It had a pressed tin ceiling, permanent seats, a carpeted aisle, decorative plasterwork, frescos on the wall depicting landscapes and classical scenes, and, up front, a Wurlitzer theater organ. 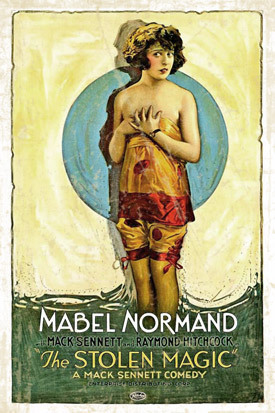 Anticipating the theaters of the 1920s, The Photoplay tried to convey an atmosphere of class, respectability, and refinement. However, like The Ideal, The Photoplay was still an improvised theater. It shared half of a retail building. The space was not built specifically to be a theater. It was small and cramped. The building measured about 20' by 70'. Just 1,400 square feet. After subtracting space for a narrow aisle, concessions, ticketing, the projector, the organ, and the screen and allowing a very tight 6 square feet per person, the theater could have seated only 150 people. Like other storefront theaters, it had a flat floor which created viewing difficulties. The Photoplay dealt with this by raising the screen but that required audiences to look up creating other problems. It also shared problems of ventilation and cooling in the summer. Advertisements from The Ohio State Lantern for films at the Photoplay, fall 1916. In the end, The Photoplay was just too small to survive. As larger, nicer, more comfortable venues appeared, in buildings specifically built as theaters, small theaters like The Photoplay saw their business ebb away. By 1923, there were just 40 theaters citywide and only three in the University District. No storefront theater in the University District lasted past 1922. This as movie attendance more than doubled. The storefront theaters were being pushed out as the real movie theaters took over. The Photoplay appears to have shut its doors some time in 1920. After the theater closed, the building housed restaurants, retail establishments, bars, and finally part of a bank. The building was torn down as part of the South Campus Gateway redevelopment in 2002. Its former site is more or less where Five Guys Burgers is currently located. South Campus, 1997. 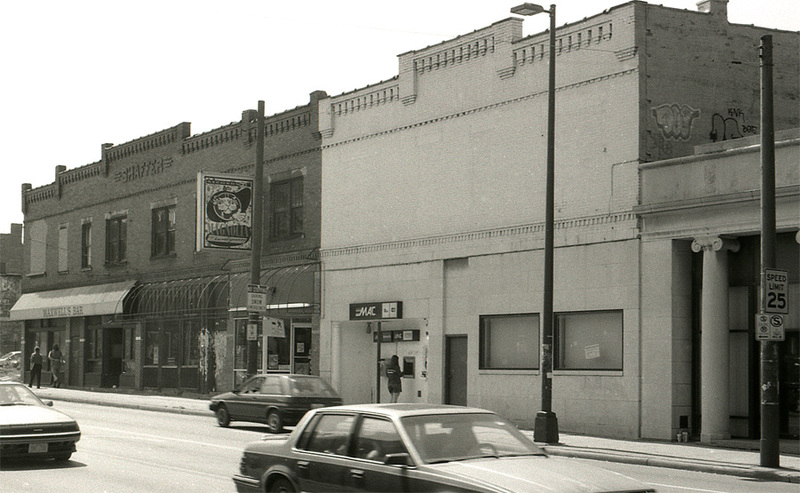 The former location of the Photoplay Theater, 1597 N. High St., is in the white building, on the side with the ATM machine.